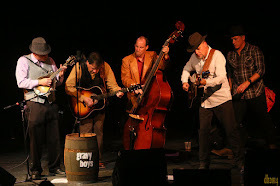 The Wide Open Bluegrass Festival is proud to once again host the always entertaining Americana band, The Gravy Boys. This five-piece acoustic group offers true lyrical genius, sharing classic themes that resonate with listeners of all ages. Gravy songs are created collaboratively, with each member having a significant role in sewing the lyrics together. This talent for writing and performing has gained some recognition for the band recently, playing the highly respected MerleFest and the Wide Open Bluegrass Festival in years past. A show with The Gravy Boys promises to provide boot-stompin' fun with vocal harmonies and lively banter. With three of the bandmates being brothers, the boisterous jeering comes naturally, and makes the audience feel like they're at a family gathering. Crowding around one condenser mic, the band's strong musicianship and engaging harmony is evident. The group's talents mesh together intricately, but they are equally able to spotlight individual talents, taking turns soloing on the mandolin, guitar, harmonica, and bass. While The Gravy Boys are immersed in tradition, their shows also offer some surprises, including unconventional covers like The Zombies' "Time of the Season." To see a complete listing of showtimes, bands, and to purchase tickets, visit the IBMA website.